FREQUENTLY ASKED QUESTIONS | Have a Question? Contact Us! In the north of Finland, where the Santa lives there is thousands of square kilometers of pure untouched powder snow. To get there you need dogs, reindeer or a kite. When? Is it possible to snowkite all year around in Levi? The season starts in February and lasts until April. The season is short - make your bookings in time! Usually, March is booked 6 months earlier. Levi is one of the largest winter sport and snow activity destinations in Northern Europe. Though it's still not crowded at all. Levi takes your breath away with it's untouched nature, colorful and incredible Northern Lights, friendly Lapish people and of course tons of pure white snow. Levi has the second purest air in the world, even the Santa Claus has moved here to take a deep breath. Yes, you can even drink from every river or stream. Snow is always 100% white. 3D snowkiting - what is it? Lot of kiters in nordic hemisphere practice snowkiting on frozen lakes or sea. Take the kite you are riding during the summer, also skis or snowboard and fun starts. 3D Snowkiting gives you an opportunity to ride waves on a safe mode. Imagine you are on a sea catching waves and making high flights.... but sometimes the wave hits you suddenly. It might come too unexpectedly or be as high as a house wall, it can be scary as hell. Snowkiting in mountains creates the situation where waves stay still and you are the King, you decide whether to go through, to jump or not. Levi is accessible by plane and train. Nearest international airport is Kittilä (KTT), 16 km from Levi. Second option is to fly to Rovaniemi (ROI), it is 180 km from Levi. 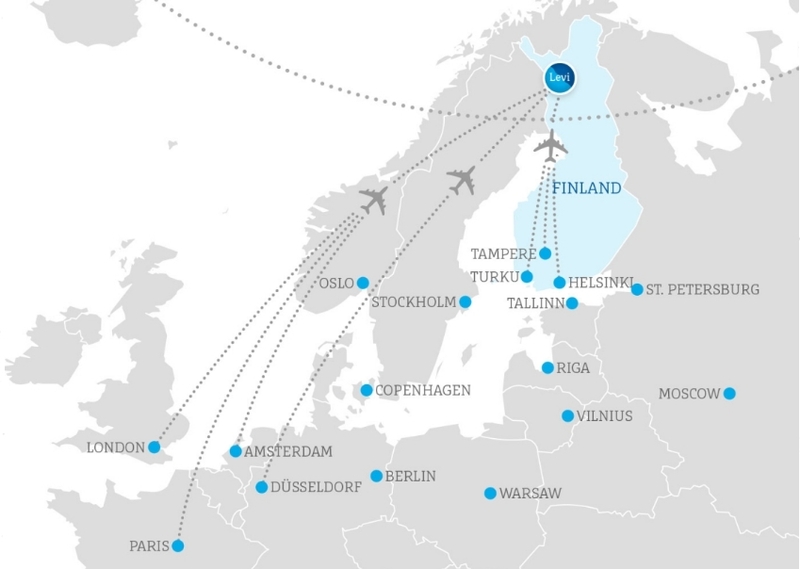 Both airports have several international flights, but check also connections via Helsinki. There is very convenient night-train from Helsinki which also carries your car if needed. The train has two routes, one stops in Rovaniemi (180 km) and the second one stops in Kolari (120 km). You need smaller kites (6-10 m2), skis or snowboard, warm clothing, protective gear and a valid insurance. Everything else is arranged. If you need kites, skis or clothing please let us know. This is absolutely question of taste. Both are ok. We suggest that you take what you feel comfortable. You do not need to learn snowboarding if you like skis more. The course will be much more efficient if you focus on kite, not learning snowboarding same time.